“Terrifying beautiful”. “De Utvalgte once again show that they have a distinctive voice and vision, they represent the important alternative theater.”- Andreas Wiese, Dagbladet. “This is original performing arts at the highest level.” – Idalou Larsen, Klassekampen. When “Adam and Eve” were banished from the garden, they left also has their place in nature. Could it be that we have always longed to return, and that this longing reflects our basic sense of loneliness? In our culture the ideal has been rationality and reason. The animal has been a symbol of the wild and evil that must be controlled and tamed, like the irrational forces in man that threaten our understanding of the world and ourselves. On his way out of into the forest, Little Red Riding Hood is instructed to follow the right path, and not to fall for the temptation to go outside. She is driven out into the wild and ends up being eaten. In her book “The lonely monkey” (Bergljot Børresen, 1997) Børresen launches the theory of “hunter insensitivity.” She claims that it kicks in when the hunting instinct is in action, and that it applies to all who have animals on their menu. This instinct acts as a switch that turns off the empathy with the prey. “The Art of becoming tame” takes place in an expressive visual universe with free associations to the beautiful and the hideous, the longing for the wild, and the need to tame and to become tame. In The Art of becoming tame, De Utvalgte for the first time use 3D video as a scenography. The actors move in and out of different landscapes in 3D. De Utvalgte have worked with video for many years, and working with 3D images became a natural development in the attempt to integrate the actors and video in a whole onstage. De Utvalgte strive to create a living and changing scenography that interacts with the actor. A Finnish study shows that we become more emotionally involved when we look at 3D images compared to two-dimensional sizes. Therefore, it has also been natural to try to develop this technology into theatrical imagery. 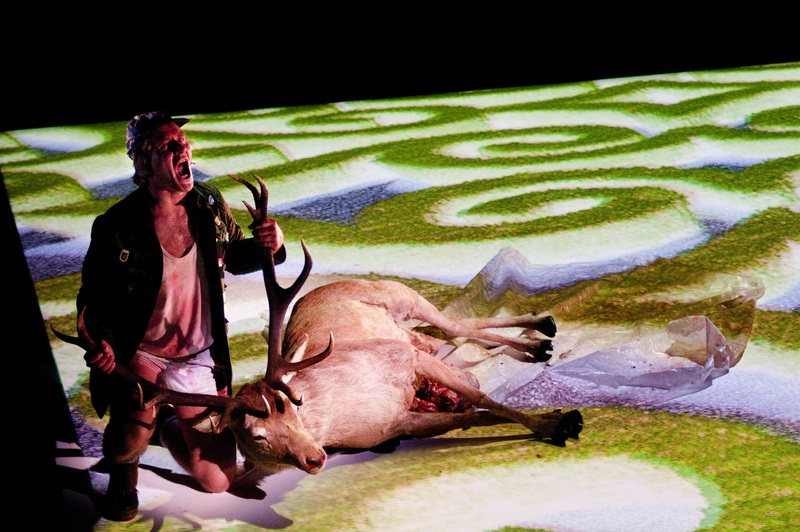 Boya Bøckman received the Hedda Award for best visual design 2012 Critics Award 2012 for best performance and the company received the Ædda award for contemporary relevant project, smaller stage in 2012. Director: Kari Holtan. Video / lighting design: Boya Bøckman. Dramaturg / Producer: Anne Holtan. Producer: Maya Liu Bøckman. Scenography: Carle Lange. Costume Designer: Gjøril Bjercke Sæther. Sound design: Merete Mongstad. Sound: Jon Platou Selvig. Starring: Kari Onstad, Randi Rommetveit, Torbjørn Davidsen and Pelle Ask. Text: De Utvalgte, Kari Onstad, Randi Rommetveit. Supported by the Norwegian Cultural Council. Co-production: Black Box Theater, Comédie de Caen and BIT Teatergarasjen.